The 1st contender is Sashi Giggle Esmeralda who studied Fine Arts major in Interior Designing. She is currently an online seller and a stand-up comedian. The next contestant is Jose Neneng Bagsik Romines, a high school graduate. She is a member of Golden Gays Manila and works as an events host, comedian and impersonator. Last but not the least is Yoniel Torayono Bahandra Acebuche. She is a Grade 12 student and a campus journalist. Yoniel also works as a freelance makeup and hairstylist. The 3 contenders were asked to check their buzzers to make sure it is working. Vice then gave the 1st question about Italian painter Leonardo Da Vinci. Yoniel is the 1st one to give the right answer and will advance in the 2nd round. For the next question, Jose presses her buzzer but unfortunately, she gave the wrong answer. It is now Sashi’s chance and luckily, her answer is correct and will also advance in the next round while Sashi is eliminated. Yoniel was called by Vice and she revealed that she is a kontesera in hairstyling and make-up contest. Her question then says; if Aqua Man is a human, can he experience spasms? She answered that even though Aqua Man is a superhero, he will suffer from this condition because every human being will undergo from it. Sashi is next one to be called and her question says; can Wonder Woman be included in 7 wonders of the world? She stated that Wonder Woman should not be involved in 7 wonders of the world because she is a person not a place. After a deliberation, Yoniel is chosen to compete with the reigning queen. Yoniel and Bambi are now going to answer the same question and it says; Are the people who forgive really forget? The daily winner is the 1st one to answer and she said that a person cannot forget the things that a wrongdoer have done to her/him because once you broke his trust, it will be hard to earn it again. Bambi on the other hand stated that a person can forget because if you forgive a person wholeheartedly, it will feel good. 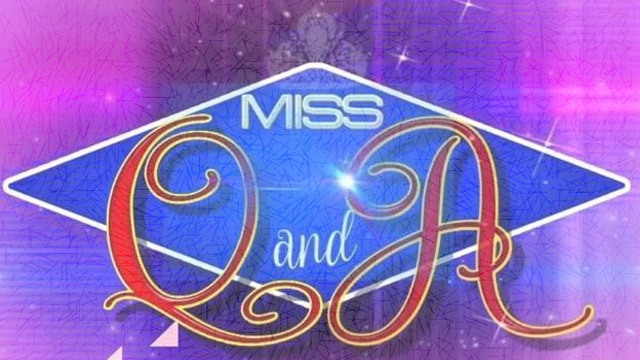 Based on their answers, the judges prefer Yoniel and now the new queen.